It's great that Cheshire East is spending some of the LSTF funding on infrastructure. We believe that listening to cyclists before deciding would save money and be more effective in promoting active travel. These odd, and doubtless expensive, racks have been placed in Queens Park along the connect 2 route, but on the other side of the park to anywhere where anyone would stop. I have never seen them used. We would have advised putting a simpler one by the swings, cafe, offices or boating centre. It could have been just a section of perimeter fencing, more in keeping with the park heritage. update, a year later, this is still there, but broken, and another has appeared on the other side of the park, but still not one where needed, by the cafe. This photograph shows the two cycle racks outside the busiest council office in Crewe, and headquarters of the LSTF and Highways team. I took one of the officers to show how the hedge should be cut back to allow parking in May. This photo was taken today, 19th October. Can you see the racks? How much would it cost to cut the hedge? update, summer 2015,the hedge was cut, but really just exposed the rather inadequate rails. we were very pleased to see the covered shelter on nearby Market Sq. Sadly we were only asked to give opinions within 3 days, then it took four months to install. Is it possible to cycle round Crewe off road? 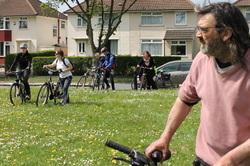 15 local cyclists had a go today in glorious sunshine. We left after the Tea and Tinker session at CC Cycles to try to complete a circuit on segregated paths. The first snag we hit was that there are none that connect with the town centre so our first 200 yards were squeezing past parked cars down Broad st to connect with the start of the Leighton Greenway. We went round that then back across Broad st, over the footbridge across the West Coast mainline at the north corner of the cemetery. Why is this pedestrian only, and why is the gate to the cemetery welded shut folk asked. we then went round Sir William Stanier school to find a link with Sydney Road Bridge. Pushing bikes over a bumpy meadow (pictured)we found a narrow rough path to the bridge where we had to cross between the single phase lights and back again to connect with the footpath alongside the rail line to hungerford Surgery. Although we were going extra carefully at this stretch, as it is not yet a designated shared space, we still overtook a train pulling into the station! Going round School Crescent and crossing Hungerford Rd we joined the brand new Macon Meadow path to the Macdonalds Drive Thru. Resisting that challenge we focused on getting past Crewe station. The roundabout is too daunting for novice riders and the clockwise path leads you into the two lane merge, which even in a car is scary, so we opted to cross by the garage and push our bikes past the station to Pedley St where we joined the new path which forms part of the new route to town along Edleston road. We found that apart from links in the centre of town, a few non cycling paths, and of course, Nantwich Road at Crewe station, it is possible to get round town to work, leisure or shops off road, if you are willing to take long detours and go slowly. CC-Cycles is based in the St Paul’s Centre which is most famous for its Friday Furniture Sale; but it is more than that, and others are starting to recognise this. Nominated for the Sustainable City Awards CC-Cycles were at The Mansion House ceremony last Thursday to receive their Certificate in the Sustainable Travel and Transport Awards. ‘With a tiny budget and local residents volunteering this recognition is great for Crewe and brilliant for the team that achieved it’ said Rob Wykes the Charities Director. On the way to the awards, the team cycled to the House of Commons where Edward Timpson, the Crewe and Nantwich MP, congratulated them, and expressed his delight that once again Crewe is being recognised for innovation and entrepreneurship in sustainability. He said ‘it’s positive for Crewe and a clear message to the country that we are serious about sustainable travel’. The workshop is a skills development hub for young and old alike, and has recently been expanded. It is fully equipped and it is common to see retired Bentley engineers teaching young adults traditional mechanical skills. More importantly these young people gain positive attitudes towards work by working alongside experienced engineers. Rob Wykes explains how important it is to help young people make the connection between what they do in the workshop, and the income it can generate. ‘In our workshop these young people see their effort reaping a reward and they become energised.’ As Crewe lifts its eyes to the horizon of HS2, more employment, more houses, more traffic and more things to do, means that cycling will again become an essential choice of travel around town, and CC-Cycles has a huge part to play in this. The ad had a lot of complaints from cycling groups for not asserting cyclists rights enough, and your decision gives a clear message that cycling is dangerous and we should not be entitled to share the road. Cyclists in Holland do not wear helmets because drivers give them room, respect and responsibility to share the road. Your ban flies in the face of gradual progress for healthy, sustainable travel. At mid day today, 30th January 2014, the ASA rescinded the ban! For the second year running the British Cycling Annual General Meeting was held in the 'cycling capital of Cheshire' and home town of Shanaze Reid. 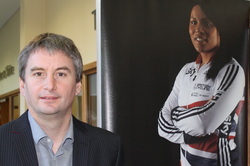 British Cycling's Chief Executive, Ian Drake, (pictured at Crewe Hall) thanked ACT's welcome to the town and said it was a fitting venue to celebrate the extraordinary success of the sports governing body whose membership has reached 80,000 with over 40% year on year growth. When asked why none of the hundred plus delegates had actually cycled to Crewe Hall he explained that delegates had come from all over the country, and most train services to Crewe only take four bicycles. He agreed that cycling infrastructure has to be a priority. Weston Road, which connects Crewe Hall just a mile from the station, is notoriously unattractive to local cyclists. The road is unlit, too narrow for vehicles to pass a cyclist with oncoming traffic, and the footpath is narrow and overgrown. It is in fact the only place where I have come off a bike in the last 15 years, trying to hug the kerb. There are many workers at the Hall who work shifts out of bus hours who have to cycle along this dangerous road. If it is not suitable for the nations top cyclists, why should we subject our own people to this danger? Funding and planning permission has been obtained for the the new Crewe Green link road which will connect Weston with the University Way /Weston Road roundabout.. This new road is costing £27 MILLION for 1.1 km of dual carrageway. Yes, it will have a cyclepath, but it would be invidious to spit cyclists out on the totally unsuitable Weston Road. We suggest that the existing road should be downgraded from an A road and traffic calming or even closure should be considered. This will encourage vehicles to use the wider bypass and make the approach to Crewe Hall a safe and pleasant experience which will boost local tourism. Are you a cycle champion? Active Travel Crewe want cycling and walking to be a popular option in Crewe to improve poverty, health, environment, economic, and accessibility outcomes. We are seeking strong political leadership, and more commitment from Cheshire East Council for this. 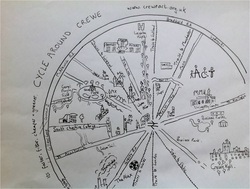 CEC estimates that there 8% of journeys in Crewe are by cycle. This is higher than the national average, but this actually represents a decline; we used to cycle more than Oxford who now boast 28%. As the Cheshire East transport policy points out, Crewe is small and flat like Holland, so why don’t we enjoy their cycling success of more than 40%? Dutch leaders made a political commitment to cycling after the 1970s oil crisis and a rise in road accidents. We have fuel debt in town, do we have to wait for a cycling fatality? We just want an aspiration of 20% for short urban journeys within town. This would be in keeping with the All Change for Crewe vision, regenerating the town as a green, modern, forward thinking one on par with the best British stories of great town planning. It is immediately obvious how effective cycling provision could contribute to the All Change for Crewe aims, but this rests on the ‘quality image and perception of leadership’ at all levels, as David Cameron explained this week when he announced his cycling funding saying; ‘Cycling is high, we want to see it soar... business, local government developers road users and the transport sector all have a role to play in this’. CEC would have to invest approx £700k per year in Crewe. Compare this with the estimated costs of widening Sydney Road bridge and improving Crewe Green roundabout, (both snags incidentally caused by increased vehicle traffic). Creating cycle infrastructure represents a fraction of the £27.9m FfT road funding that the Crewe area has been awarded recently. Boris has a strategic view, expecting London's population to grow by about 15%. CEC is wanting Crewe to grow exponentially. Many of the objections to growth are to increased traffic and pollution, which could be avoided with proper cycling infrastructure. 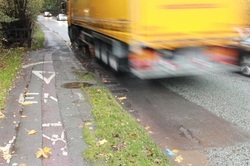 Where paths are not possible, Cheshire East has already implemented very creative solutions, such as the Poynton Shared Space, which was recommended by the Institute of Civil Engineers this month. The cost of obesity, health and wellbeing are rising constantly. We would expect CEC officers to recognise this challenge and to be preparing the way for joint working with public health to encourage active lifestyles. Why not cycle in Crewe; safety, speed & spends. Speed; In peak times it is the fastest way to get around. It takes just ten minutes to ride moderately from the town centre to Bentley, a bit less to the station, a bit more to the hospital. If I have luggage or am picking up people from the station, it is usually slower along Nantwich road by car. I filmed the cycle ride in rush hour and slowly passed 48 cars between the Manor and Mill St.
Spends; you can get a second hand bike for as little as £10. Even if you bought a new bike you could pay for it in less than 6 months in fuel costs alone. 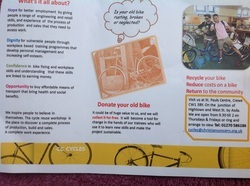 You might also like to donate your old one to CC Cycles whose trainees will recycle it as part of this valuable community project: recycle, reuse and return! They will also run maintenance classes so you can keep your bike going at little cost. Bentley boost; bikes routes or road blocks? We are very pleased to see the announcement in today’s news that Bentley will be employing another thousand workers. We hope that these workers will be local and will have realistic options of not driving to work. Increased traffic in Crewe will have an adverse affect on the local economy, health and wellbeing. We think that this is the moment to think seriously about developing better conditions for walkers and cyclists and make our town the significant cycling centre it once was before planning and employment changes favoured car travel. Increase vehicle traffic and on-street parking has discouraged cyclists and walkers, especially at the many railway bridges. There are fewer green corridors and the main employment sites, such as Leighton Hospital and Bentley Motors are on the edge of town, at the furthest point from the railway station. Post-Connect2 government and agency grants to help Crewe infrastructure will reduce. The main purpose of Connect2 though was to show communities/councils how different things could be with new bridges/new routes/junctions sorted out with strong community involvement. - Open up east arch in Mill Street railway bridge to create a safer link between the station and town. - Bridge from the Macon Way area across the southern edge of Grand Junction to Vernon Way. - Bridge over electric lines at Bombardier from Tipkinder Park to Dunwoody Way. - Construct a pedestrian bridge on Sunnybank Road which is a dangerous pinch point to Bentley. - Traffic lights control with pedestrian/cycle crossings at Macon Way/ Hungerford Road. - As above at Bradfield Road/Flowers Lane. - Reduce West Street between Hightown junction and Vernon Way to halve its width. Reclaim the remainder for pedestrians/cyclists/landscaping/fruit trees. - Close Smithy Lane to all except emergency vehicles, encouraging hospital staff to cycle and solving the dangerous junction with Middlewich Road. - Town centre alterations to give through access to cyclists, which was stopped 20 years ago. - Close Victoria Street to any traffic, creating a tree lined boulevard. - Create a public square on Hightown where the current buildings are partially demolished. When you consider the ten million pounds earmarked for Crewe Green roundabout and Sydney Road bridge widening schemes, these ideas are very modest. New roads cost in the order of £10-30m/km depending on their width and structures required. New road building won't change anything in the long term, but the behaviour changes that our suggestions will facilitate, will make Crewe a healthy, social and prosperous town for the next hundred years and be a fitting legacy for our successful rail and car industries.